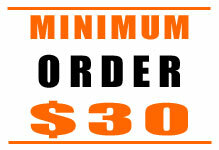 Aussie Pizza Supplies is the #1 online supplier of commercial pizza equipment and supplies in Australia. We service independent and franchised pizza businesses as well as restaurants and cafes that deliver pizza as part of their menu. Our No BS! 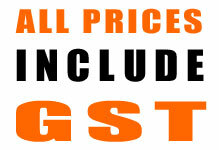 Price Policy ensures that everyone gets genuine wholesale prices on commercial pizza equipment everyday. Where has all the service gone? YOU don't neglect your customers and neither do we! The team at Aussie Pizza Supplies is dedicated to streamlining the process of buying your commercial pizza supplies and professional pizza shop equipment. We're constantly refining our products, back end systems and integrations to ensure that you can easily find the items you need, smoothly complete your purchase and receive your pizza supplies quickly. Our online store is available 24hrs a day, 7 days a week and our friendly staff are only ever an email or phone call away. 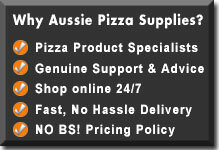 You can buy from Aussie Pizza Supplies with confidence, knowing that you're getting quality equipment at wholesale prices and being looked after at every step of the way. Aussie Pizza Supplies has the largest range of commercial pizza equipment and products specific to pizza restaurants in the one place and we’re still adding more! As well as pizza ovens you'll find a range of quality products at wholesale prices including commercial refrigeration including make/prep benches, commercial pizza ovens, commercial cooking equipment, and pizza delivery systems as well as wholesale kitchenware, utensils and accessories.We also have the best pan gripper in the industry! If it’s shelving you’re after, we’ve got a range of anti-bacterial storage solutions to fit any space and budget. Or perhaps our table service section will interest you, with everything you need for a dine-in restaurant, including glassware, cutlery, smart candles and our very affordable ‘Aussie Pizza Supplies’ range of crockery. We even have ! Now when it comes to delivery you can't go past the Cooktek Pizza Delivery Bag System for keeping your pizzas hot and fresh. And have a quick look at our discount pizza boxes that offer great quality at low prices. Aussie Pizza Supplies has an extensive and ever expanding range of quality pizza equipment for sale, supported by Australia’s leading manufacturers and importers. All of our products have been carefully selected with the professional pizza chef in mind. And we've worked hard to negotiate the very best prices so you can be sure that you're purchasing at true wholesale prices each and every time. And with a pizza oven range covering products from the top 6 commercial pizza oven manufacturers in the world you can be sure to find the right oven at the right price at Aussie Pizza Supplies. Buying big ticket pizza equipment can often interfere with your cash flow, especially when the purchase is unexpected. That’s where financing your commercial pizza equipment with Silverchef can get you the equipment you need now without the financial hassle. With Silverchef’s Rent-Try-Buy Solution you can rent your pizza equipment over a 12 month period until you’re either ready to buy the equipment outright, upgrade to newer models or simply hand it back. 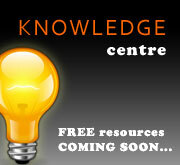 Why not complete the easy on-line Application Form for a quick pre-approval today. You’ll find most of our products are in stock everyday and ready for shipping across Australia. We supply to Sydney, Melbourne, Brisbane, Perth, Adelaide and everywhere in between. No matter where you are, we can deliver.